I started bodybuilding nearly twenty years ago, and during that time, I’ve had the opportunity to experiment with literally dozens, if not hundreds of high intensity training methods. These include supersets, giant sets, pre-exhaustion, negatives, partials, static holds, continuous tension, peak contraction, 5 sets of 5, 8 sets of 8 and 21’s just to name a few. If I were only allowed to pick one high intensity technique for building muscle, that technique would be drop sets. That’s right – I personally believe that drop sets are the best high intensity bodybuilding technique of all time. Read on to find out why and to learn twelve ways to use drop sets for some of the most amazing muscle growth you’ve ever experienced. What Are Drops Sets And Who Invented Them? A drop set is the simple technique where you perform a set of any exercise to failure or just short of failure, then drop some weight and continue for more repetitions with the reduced poundage. According to Arnold’s Encyclopedia of Modern Bodybuilding, the drop set method was originally “discovered” in 1947 by Henry Atkins, editor of Body Culture magazine. Atkins called it the “multi-poundage system.” Since then, this muscle blasting technique has gone by many different names including breakdowns, descending sets, triple-drops, down the rack, strip sets or the stripping technique. Why Do Bodybuilders Love Drop Sets? Bodybuilders are unique among athletes because they’re concerned purely with cosmetic improvements and not athletic performance. That’s why bodybuilders prefer drop sets – because they’re decidedly geared towards increasing muscle size (hypertrophy). By contrast, you don’t see a lot of football players, sprinters or other athletes using drop sets, because drop sets are not conducive to strength, power or speed gains. In fact, most athletes want strength and power without bulk, so drop sets are usually nixed. However, if pure mass is what you’re after, then drop sets are ideal! How Drop Sets Work: Breaking Down Muscle Fibers… Deep Down! Let’s suppose you’re doing bicep curls with 125 pounds for a set of 8-12 reps. The 10th rep is difficult. The 11th rep is extremely hard, even with a little cheating. The 12th rep takes an all out supreme effort. Gun to the head – you still couldn’t do a 13th rep. You’ve hit honest failure. But if you strip some weight off the bar – about fifteen to twenty percent or so, you can keep going. Even though you may reach a point of momentary muscular failure after 8-12 reps in a conventional straight set, you haven’t reached absolute failure; you’ve only reached failure with that poundage. You see, in a single straight set performed to failure, you don’t activate every fiber in a muscle group. You only recruit the number of fibers necessary to lift a particular weight for the desired number of repetitions. By stripping off weight and continuing the set, you cumulatively recruit more and more “reserve” muscle fibers. Drop sets hit the “stubborn” muscle fibers “deep down,” causing growth that normally couldn’t be achieved by stopping after a single set of six to twelve. Drop sets were a favorite of none other than Arnold Schwarzenegger. Thanks to Arnold popularizing the method, it’s a common sight in any gym today to see even recreational lifters doing barbell curl “stripping sets” as Arnold liked to call them. But this method only scratches the surface of the many ways drop sets can be used. I’ve discovered literally dozens of creative ways to use drop sets and I’d like to share a twelve of the best with you here. This was Arnold’s favorite method for bicep training, but it can easily be used on any barbell exercise. All you have to do is put small plates on each side of the bar and strip them off when you reach failure. For example, if you set up an Olympic barbell with four ten pound plates on each side, that’s 125 lbs to start, then by pulling a ten off each side (about fifteen percent), you now have 105 lbs. After eight more reps, you pull another ten off each side and continue with 85 pounds. Stripping plates off barbells and plate-loaded machines can be messy, cumbersome and time consuming (unless you have a partner or two). Drop sets are easier with machines. All you have to do is pull the pin out of the weight stack and move it up to a lighter weight. On a leg extension machine, for example, you don’t even have to leave your seat to change the weight. This allows for a quick weight change, which intensifies the set. Going down the rack is a fantastic technique for dumbbell exercises, especially curls, lateral raises and shoulder presses. For example, if you’re doing dumbbell lateral raises, you could start with the 40’s, do eight reps, then put the 40’s down and grab the 30’s, then put the 30’s down and grab the 20’s and rep out some more. Try this technique on your next deltoid or bicep day and your arms and shoulders will pump up like balloons. A tight drop set refers to a small weight decrease between drops. Tight drops are more difficult, and “tightening” up your drop sets can even be used as a method of overload. The average weight reduction for a drop set is approximately fifteen percent. That would be like loading up 225 lbs on an Olympic bar for bench presses, then dropping to 190 lbs, then dropping to 160 lbs. If you did your next drop set workout at a twelve percent reduction (225 lbs, 200 lbs and 170 pounds), that would be an overload above and beyond the previous workout. A tight drop set would include any weight reduction between five and twenty percent. Tight drop sets are more often performed on small muscle groups and isolation exercises. For example, if you’re going down the rack on dumbbell curls, you might start with 50 pounders and drop to the 45’s, then the 40’s – a ten percent decrease per drop. A wide drop set refers to a larger weight decrease between reps. Wide drops sets are easier than tight drop sets and they allow you do higher repetitions. Because of cardiovascular fatigue, wide drops are often used on large muscle group exercises like squats, bent over rows and leg presses. For example, in the squat you might begin with 315 lbs on the bar, then strip an entire 45 pound plate from each side and go on to 225 lbs, nearly a 30% drop in poundage. Then you might strip another 45 pound plate off each side and go with 135 pounds (a 40% drop). Believe me, 135 pounds never felt so heavy! The “halving method” is a wide drop set that allows you to use two totally opposite rep ranges, each of which will attack a different aspect of the muscle cell. This allows excellent muscle growth plus an incredible pump! After warming up, begin by choosing the heaviest weight you can handle for six reps with strict form. Perform six reps, then without resting, reduce the weight by exactly fifty percent and continue for twenty repetitions with the lighter weight. Let’s use one arm dumbbell rows as an example. If your six rep max is 110 pounds, start with six reps with the 110’s, then immediately grab the 55’s and bang out twenty good reps.
You’ll be winded and you’ll feel something in your lats you’ve never felt before! This was a favorite method of Larry Scott, the first Mr. Olympia. Scott used this technique to develop monstrous deltoids and arms, even on a less than genetically optimal frame. Larry believed that heavy weight and low reps (six reps) were the best way to develop size and strength concurrently. This rep range allows you to use heavier weights, which can help maintain your strength levels and thicken up those muscle fibers without much of a pumping effect. Begin with a six rep max, then drop the weight by about ten to fifteen percent with each drop. Repeat with the lighter weight for six more reps for the desired number of drops. An ascending rep drop set means that you decrease the weight substantially enough so you can increase the number of reps you perform with each weight reduction. For example, if you’re doing tricep pushdowns and 100 pounds is your six rep max, you would start with 100 pounds, then pull the pin and go to 75 pounds (twenty five percent reduction), which is a wide enough drop so you can hit ten to twelve reps on the next round. Then you’d finish by pulling the pin and going to 50 (thirty three percent reduction), which is very light, allowing you to “rep out” and perform fifteen to twenty reps on the final drop. Descending drop sets are when you perform a very tight drop set, so your reps actually decrease with each weight reduction. For example, if you’re doing bench presses with 225 pounds for twelve reps, you’d strip off a small amount of weight (five to ten percent), then continue for six to eight more reps. Then you’d pull off a little more weight and shoot for four to six reps. You’d then finish by dropping a small amount of weight again and doing two final reps. This is one of my favorite methods because it can hit a multi-faceted muscle from every conceivable angle. For example, the leg press machine can be used to place emphasis on the medialis (“low quad/teardrop”), lateralis (“outer quad”), adductors (inner thigh) or the hamstrings and glutes, all depending on where you place your feet on the platform. For a leg workout you’ll never forget, load up the sled with 45 lb plates, (the ladies might use 25’s), then perform 6-12 reps with your feet in the middle of the platform, shoulder width apart then strip a 45 off each side, then do 6-12 more reps with your feet high on the platform, then strip another 45 from each side, then do 6-12 more reps with your feet together and low on the platform. Strip off another 45 and finish with your feet very wide and toes pointed out at forty five degree angle for the last 6-12. Three weight drops, four poundages, four foot positions, and a workout that will make your thighs grow from top to bottom, inside to outside! Zero rest drop sets are incredibly difficult and most people either deliberately or unconsciously avoid them because they’re so hard. A zero-rest drop set is where you literally cut the rest between weight changes to zero. To perform an “honest” zero rest drop set, you usually need a training partner (or two). For example, If you’re doing drop sets on the leg press by yourself, you have to get up, walk to one side, strip off a plate, walk to the other side, strip off another plate, then sit back down and resume the drop set. This process takes at least ten seconds. Within that time, your muscles have already begun dissipating lactic acid and regenerating their energy supplies. If you have two training partners, you can do a true zero rest drop set by having each of your partners strip a plate off each side without you even racking the weight. Rest pause drops sets are the opposite of zero rest drop sets. On a rest pause drop set, you deliberately rest 5, 10 even 15 seconds between weight changes to allow yourself to briefly recover so you can use heavier weight. This gives you the best of both worlds; the deep fiber-attacking effect of a drop set, along with the heavier weights that enhance strength. Use this technique when muscle size and strength are both priorities. Here’s how it works: First select the two exercises for your superset. If it’s shoulder day, it might be dumbbell lateral raises and dumbbell presses – a pre-exhaust superset. Start with lateral raises using you regular 8-12 rep max, let’s say 35 lbs for this example. Then go right into dumbbell presses with as little rest as possible and a little less weight than your usual 8-12 rep max – 65 lbs or so should do the trick. Now, continue with no rest to a lighter set of dumbbells (25 lbs) for another set of side laterals. Then pick up the 55 lbs dumbbells and go into another set of shoulder presses. Finally, drop down to the 15 lbs dumbbells for the last set of lateral raises, then go straight into presses with 45 pounders. That’s ONE drop-superset. This is an extremely intense technique, so use these sparingly. Here Are Some Tips For Maximizing The Efficiency Of Your Drop Sets. Usually, the time between weight drops ranges from zero to ten seconds. Even if you’re doing heavy power drop sets, the rest between sets should still be relatively brief. In general, the briefer the time between the weight change, the more intense and effective your drop set will be. To move quickly from one exercise to the next, you should have all your equipment set up and ready before starting the first exercise. Instead of putting big plates on a barbell or machine, load it up with 5’s, 10’s or 25’s, ready to be stripped. If you’re doing triple drops with dumbbells, line up all three pairs beforehand. 3. Train When The Gym Isn’t Crowded So You Have A Dumbbell Rack To Yourself. Drop setting isn’t practical in a crowded gym, nor is it proper gym etiquette to hog three or four sets of dumbbells all to yourself for 15 minutes. If you’re planning to use down the rack drop sets, try to schedule your workout for a time when the gym isn’t crowded and be courteous to others. 4. Use Two Weight Drops (three different poundages) Most Of The Time. You can really go “crazy” with drop sets and reduce the weight as many times as you want. However, there seems to be a point of diminishing returns after two or three weight reductions. The most common drop set method is a triple drop, where you use three weights and two weight reductions. 5. Stay In The Six To Twelve Rep Range Most Of The Time. Six to twelve is the most productive rep range for bodybuilding purposes and this rule should generally not change in a drop set. If you want to work on maintaining or even building strength, go with four to six reps. If you want pure hypertrophy, keep your reps around eight to twelve. 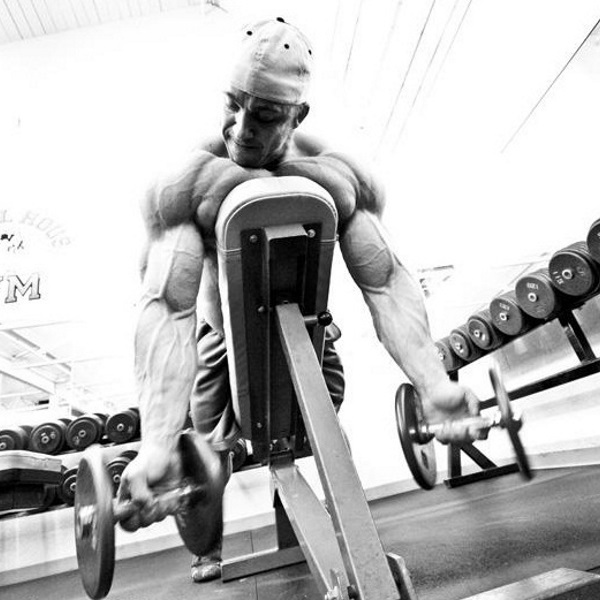 For a skin-splitting pump, occasionally go up to 15-20 reps, especially on your last drop. 6. Begin With A Six To Twelve Rep Max. It’s not enough to keep the reps in the six to twelve range. It’s got to be a six to twelve rep MAX, not just six to twelve reps. If you start with a weight that’s too light, you’ll achieve little more than muscle pumping and flushing with the drop set technique. A true six rep max means that you can’t do a seventh rep. You should reach failure or close to it with each weight before stripping off weight. Drop sets are intense and they require caution and common sense. If you used them all the time, you would quickly burn out and overtrain. One great way to use drop sets is the 3:1 method: you perform three straight sets of an exercise, followed by one drop set. Although there are dozens of high intensity training methods you can and should use in your routines, if you only used drop sets and nothing else, this technique alone would be enough to cause some serious muscle growth in a very short period of time. Don’t just use the old Arnold standby of stripping plates off on barbell curls; try some of these new and different methods outlined in this article, like tight, wide, 6-20 and grip change drop sets. I guarantee the results will amaze and delight you!